Chanderi is surrounded by hills, lakes and forests, and there are several monuments of Bundela Rajputs and Malwa Sultans. It is situated at a distance of 127 km from Shivpuri and 37 km from Lalitpur. Air: Nearest airport is Bhopal and Gawalior. Rail: Nearest railway station is Lalitpur in Uttar Pradesh, which is 37 km. Road: Chanderi is well connected by State Highway No. 19. The Fort: Dominating the skyline of this lovely old town, is a Mughal fort. The vast fort was built on a 200-metre high hill during the Mughal period, its main gate is known as the “Khooni Darwaja”. 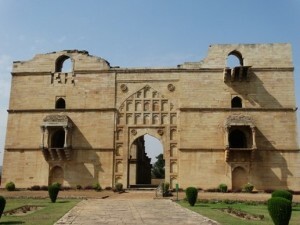 Koshak Mahal: According to historical records, Koshak Mahal was ordered to be built by Mahmud Khilji of Malwa when he passed through Chanderi in 1445 AD. The original plan of the Khilji ruler was to construct a seven-storey palace though only two could be completed during his lifetime. The Mahal is divided into four equal pars and has architecture similar to Mandu. Badal Mahal Gate: A gate without a Mahal, it was constructed to commemorate some important victory. Jama Masjid: With imposing domes and long arcades, this is possibly the biggest mosque of the erstwhile Madhya Bharat State. Shahzadi Ka Roza: The name is attributed to some unknown princess. The building is decorated on the exterior with ornamental arches and a band of geometrical design. Parameshwar Tank: Built by Bndela Rajput Kings, the picturesque Parameshwar tank is situated half a mile to the northwest of Chanderi town. 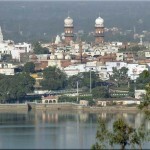 It has on its bank a well-carved temple and cenotaphs of three Rajput Kings. Battisi Bawdi: Built by Sultan Ghiyasuddin Shah in 1485, the Battisi Bawdi derives its name from a flight of thirty-two steps. Budhi Chanderi: The old Chanderi city has a number of Jain temples of 9th and 10th centuries. It attracts thousands of Jain pilgrims from all parts of the country every year. Thruvanji: 26 km South-west of Chanderi is the old village of Thruvanji. The village has a number of Jain temples of the early medieval period. Datia: Situated 34 km from Jhansi on the Delhi-Madras main line. Among the main historical monuments is the seven-storey palace of Raja Bir Singh Deo built atop a hill. It is a unique example of 17th century Hindu architecture. The other attractions are a temple with Mughal frescoes and the Gopeshwar temple. Sonagiri: This sacred Jain hill lies 3 km to the north west of Datia and is 5 km from the railway station. 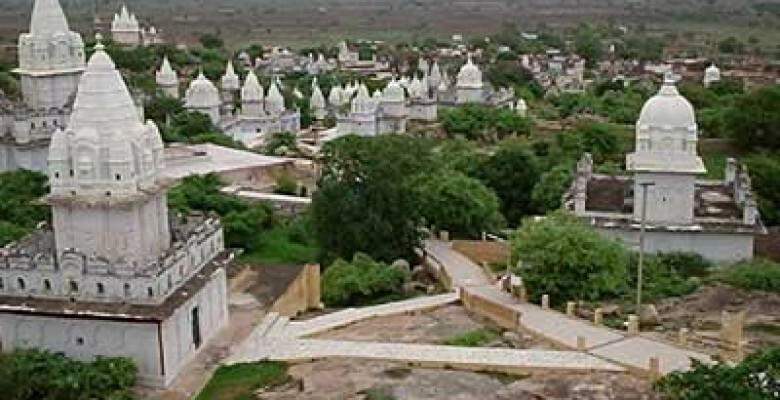 There are 77 Jain temples, built in rows on the hill and its slopes, and date back to the 17th century. Of theses the temple dedicated to Chandranatha, the 8th of the 24 Tirthankaras, is quite a large one and the most beautiful. A large annual fair is held in the month of Chaitra (April). 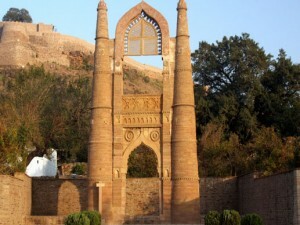 This entry was posted in Chanderi, Madhya Pradesh and tagged Badal Mahal Gate, Battisi Bawdi, Budhi Chanderi, chanderi fort, Datia, Jama Masjid, Koshak Mahal, Parameshwar Tank, Shahzadi Ka Roza, Sonagiri, The Fort, Thruvanji. Bookmark the permalink.